UPDATED 5:06 P.M. EDT U.S.A. See Comments thread below for breaking news that the judge overseeing the TelexFree bankruptcy case in Massachusetts will appoint a trustee. First reported by the Wall Street Journal. Original story on separate TelexFree matter in Oregon is below . . . 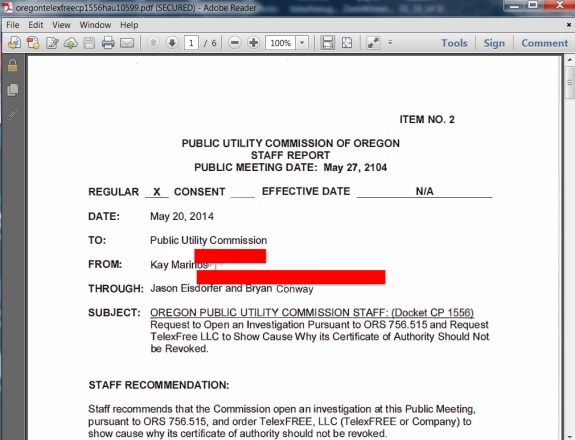 The staff of the Oregon Public Utilities Commission has recommended that the agency open an investigation into TelexFree, citing the MLM “program’s” bankruptcy filing, civil actions against it by the Massachusetts Securities Division and the U.S. Securities and Exchange Commission and the criminal charges against alleged TelexFree co-owners James Merrill and Carlos Wanzeler. Should TelexFree not respond appropriately in Oregon, the PUC staff said, the commission should strip it of its telecom license. It was a story about a U.S. Magistrate Judge’s decision not to grant Merrill bail. The Globe story notes Wanzeler is considered a fugitive by the U.S. Department of Justice. TelexFree’s licensing in Alabama also is at risk, and there could be trouble brewing in other states even as TelexFree continues to pursue Chapter 11 bankruptcy protection. In addition, TelexFree faces multiple prospective class-action lawsuits, including at least two that allege violations of the federal racketeering statute. A report in Peruvian media last week suggests that racketeering at TelexFree cut both ways. With U.S.-based litigants asserting TelexFree was a racketeering enterprise, La Republica in Peru published a report that suggested a TelexFree promoter in the country was kidnapped by fellow members last week and ordered to go to a bank to withdraw funds to make them whole. The extortion plan reportedly failed. TelexFree has asserted in bankruptcy-court filings that its future business prospects involving VOIP and app products are exciting. A U.S. Bankruptcy Trustee argued that TelexFree was advancing a “rabbit hole” narrative and expecting the judiciary to follow it. The allegations facing the Company raise serious issues as to whether or not the Company should be permitted to retain its certificate of authority. Staff has been unable to reach anyone from the Company to obtain further information. Staff stated in its communications that the Company may request that the Commission cancel its certificate under the current circumstances. It is unlikely that any services will be offered in Oregon as the Company’s assets are frozen, it is in bankruptcy proceedings, and its offices are the target of federal government activity. Nevertheless, cancelling the Company’s certificate to provide services in Oregon would foreclose the possibility. Quick note: Just observed a narrative on Twitter and Facebook that TelexFree figure Carlos Costa and his attorneys either have scored a “GIANT WIN!” or on the verge of scoring one. * TelexFree had prevailed in the Nevada bankruptcy case. * TelexFree was compliant with Massachusetts securities laws. * TelexFree was backed by the SEC. * TelexFree was operating with the authority of the U.S. Justice Department. * A U.S. Bankruptcy Judge sent the case to Massachusetts for disposition. * The Massachusetts Securities Division filed an action alleging TelexFree was an epic Ponzi- and pyramid scheme that sucked in more than $1.2 billion. * The SEC sued TelexFree, alleging an epic fraud scheme. * The U.S. Justice Department filed dozens of forfeiture or related actions and charged James Merrill and Carlos Wanzeler with wire-fraud conspiracy. Meanwhile, there are reports in Brazilian media that at least one judge has ruled that two cars owned or driven by Carlos Costa will be sold to make victims whole and that about two dozen TelexFree-related computers could be auctioned for the same purpose. A Massachusetts bankruptcy judge on Tuesday signaled he will move quickly to appoint a Chapter 11 trustee to take control of TelexFree LLC, which faces accusations of operating a $1 billion-plus pyramid scheme. Judge Melvin Hoffman of the U.S. Bankruptcy Court in Worcester, Mass., said that once additional paperwork is on file, he would approve . . . In Brazil the news tonight is that the pyramid is not Telexfree because the court accepted the bankruptcy filing. After all, if the judge accepted tax recovery, I mean it really is not pyramid? suncase: In Brazil the news tonight is that the pyramid is not Telexfree because the court accepted the bankruptcy filing. Certain TelexFree members are circulating false information. That a trustee will be appointed DOES NOT MEAN TelexFree is not a pyramid scheme. If people are telling you TelexFree has been ruled a legitimate business, they are either fracturing the facts or lying. Which brings up a different question… If US Trustees take over, that means KCCLLC and Alvarez and (something) as well as MacMillan and Runge are out of a job, right? Here’s hoping he runs for the exit at Stepfordland before the gates close and lock him in a permanent state of happy babble. He probably didn’t understand he was walking into Stepfordland. Sort of follow-up question… If Trustee takeover (in case of suspicion of fraud) is approved, that means it is effectively a Chapter 7, right? Or is a separate category altogether? K. Chang: If Trustee takeover (in case of suspicion of fraud) is approved, that means it is effectively a Chapter 7, right? Or is a separate category altogether? We will know more when the filings hit the docket. K. Chang: Somehow reading this as “Chapter 11 trustee” gives TelexZombies hope that TelexFree will rise again. Someone seemed earlier today to be priming them for great news from Carlos Costa. K. Chang: Sort of follow-up question… If Trustee takeover (in case of suspicion of fraud) is approved, that means it is effectively a Chapter 7, right? Or is a separate category altogether? It will need to follow correct procedure in the bankruptcy case. The May 27 hearing was a non-evidentiary hearing, it didn’t handle any evidence from any of the parties, it was only about “Where to go next?” (e.g. about whether the current management should continue). The court must first make decisions like that before it can make other decisions. “Other decisions” can be about dismissal or conversion to a Chapter 7 case, but until they have a management in place the case will need to continue as a Chapter 11 case. The court will probably appoint a bankruptcy Trustee (replace the current bankruptcy lawyers). The Trustee will examine the Debtor and write a preliminary report with recommendations for how to handle the case. If dismissed or withdrawn, the District Court can appoint a temporary Receiver. But currently it’s a Chapter 11 case.